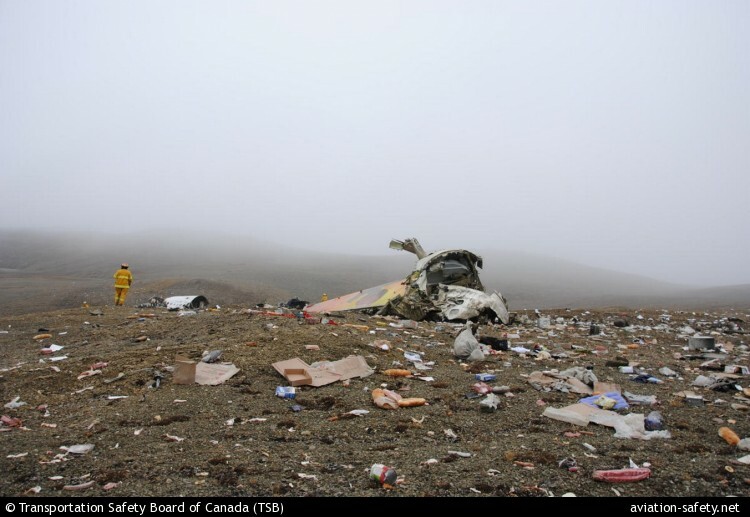 In a progress report of their investigation into a fatal Boeing 737 accident at Resolute Bay, the Transportation Safety Board of Canada currently classified the accident as a Controlled Flight Into Terrain (CFIT) occurence. On 20 August 2011, a First Air Boeing 737-210C aircraft (registration C-GNWN) was being flown as a charter flight from Yellowknife, North West Territories, to Resolute Bay, Nunavut. At 11:42, during the approach to Runway 35T, First Air Flight 6560 impacted a hill at 396 feet above sea level (asl) and about 1 nautical mile east of the midpoint of the Resolute Bay Airport runway which, itself, is at 215 feet asl. The aircraft was destroyed by impact forces and an ensuing post-crash fire. Eight passengers and the four crew members suffered fatal injuries. Three passengers suffered serious injuries. The investigators have complete the field phase of the investigation. With regards to the weather, it was reported that in the hours before the accident, the weather in Resolute Bay was variable with fluctuations in visibility and cloud ceiling. Forty minutes before the accident, the visibility was 10 miles in light drizzle with an overcast ceiling at 700 feet above ground level (agl). A weather observation taken shortly after the accident, reported visibility of 5 miles in light drizzle and mist with an overcast ceiling of 300 feet agl. The weather conditions required the crew to conduct an instrument approach using the aircraft flight and navigation instruments. The crew planned to conduct an instrument landing system (ILS) approach to Runway 35T. This instrument approach provides guidance down to weather minimums of 1⁄2 mile visibility and a ceiling of 200 feet agl. The crew initiated a go-around 2 seconds before impact. At this time, the flaps were set to position 40, the landing gear was down and locked, the speed was 157 knots and the final landing checklist was complete. Another aircraft successfully completed an ILS approach to Runway 35T approximately 20 minutes after the accident. NAV CANADA conducted a flight check of the ground based ILS equipment on 22 August 2011; it was reported as serviceable. The technical examination of the aircraft at the accident site revealed no pre-impactproblems. Analysis of the flight data recorder information and examination of the engines at the site indicate the engines were operating and developing considerable power at the time of the accident. Analysis of the aircraft flight and navigational instruments is ongoing.